Sprinkler systems are now required in new homes under construction by many jurisdictional authorities in North America. They are a proven life saver and help to substantially mitigate fire damage. What is the name of the type of valve used in a sprinkler system that uses a threaded shaft to indicate the position of the valve? What additional component needs to be present on a sprinkler system to facilitate the testing required for a backflow preventer? Should a flow switch that’s installed in a sprinkler stand-pipe system annunciate as an alarm or a supervisory on the fire alarm system? How do you clean a fire sprinkler flow switch? Are sprinkler system devices (flow switches and valve tampers) connected to a fire alarm through their respective “normally open” or “normally closed” switch contacts? When we service a fire alarm sprinkler on a floor we often get an alarm when we turn the water back on for the floor. Why? Should the low pressure switch on wet sprinkler system be on the system side riser? Why would inlet pressure in a fire sprinkler riser room increase drastically without an incoming water pressure increase? Can I monitor my fire sprinkler system through a non-ULC (Listed) alarm system? What does the Manitoba Fire Code have to say about the monitoring of sprinkler systems? Do we need to install heat tracing on fire sprinkler valves? Can an underground pipe line be used for fire fighting in areas where the temperature is below -40 degrees? What causes water to flow from a water motor gong? How many sprinkler heads will a flow switch support (how many sprinkler heads can you install on one flow switch)? How many spare heads are there required to be on a given site and where are they supposed to be located? What testing is required for a backflow preventer on a fire sprinkler system? We’ve never had an internal inspection performed on our backflow preventer and our building is seven years old. Do we need to have this done? On a recent inspection I noticed telephone wire had been strung along some sprinkler pipe. Instead of using tie-wraps, the installer wrapped a couple of loops of wire around each sprinkler head along the run. Is this permissible? What are the ULC standards for the time delay on a flow switch? What kind of signals should a fire pump provide to a building fire alarm system? Can you explain how a fire pump controller should be connected to a fire alarm system? How long do you have to repair fire sprinkler deficiencies? Does the National Building Code contain annual inspection requirements for fire pumps? How often should our fire pump be run? Can any fire alarm technician test a fire pump? If your building is equipped with pressure gauges at both the fire sprinkler and domestic water inlets, they should be reading the same pressure (give or take a couple of PSI). The most likely explanation, if you've expereinced a sudden "drastic" increase in either system, is that the gauge is faulty. Fluctuations in pressure are quite common and usually follow the demands placed on the local water distribution network. Your building may also have a fire pump which is designed to boost the pressure in the sprinkler system to ensure adequate flow. Quite often, a jockey pump is employed to maintain a slightly higher than normal water pressure to ensure fluctuations in the city supply don’t accidentally trigger the fire pump. It's also quite common to see a pressure difference between the fire sprinkler inlet pressure and what's termed the domestic supply. Typically domestic water lines are often equipped with pressure reducing valves (PRV's) as your fixtures (faucets, hot water tanks, and lavatories) are designed to operate at much lower pressures than what's actually supplied to your building. Yes and no. 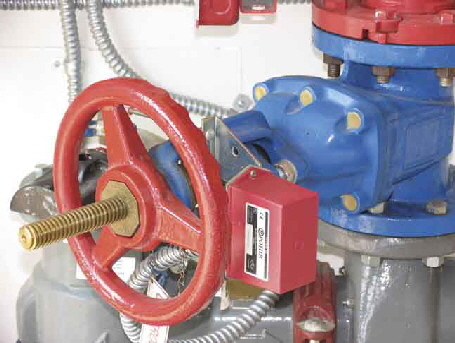 On many older systems (typically installed before 1992) it was common practice to tie in the flow switch to the sprinkler valve that controlled the zone the switch monitored. In this instance, movement of the valve handle results in a local non-latching "trouble" on the fire alarm control. Technical Note: You will come across many such installations. Your testing of the circuit's operation must ensure that the alarm generated by the flow switch has priority over the trouble indication that the sprinkler valve will cause when it's moved from its normal position. To do this, partially close the valve and ensure a "trouble" condition annunciates, then initiate your standard flow test. Sprinkler system monitoring is covered in this question. Non-ULC Listed equipment used to transmit signals to the fire department will not satisfy the requirements of the Standard (in this case CAN/ULC-S561). You can try circumventing the Code, and while the required annual inspection for the sprinkler system may not uncover any inconsistencies (owing to the technician's lack of training or a deliberate omission), an observant building inspector or fire prevention officer could turn out to be very unpleasant individual to deal with! This question is actually answered in the Manitoba Building Code and because provincial codes emulate the National Building Code, I can safely point you to this FAQ. Sprinkler valves must be installed in an area (or room) that is protected from freezing. Some local authorities take it a step further and insist that the temperature inside a valve room has to be supervised for circumstances where ambient conditions can fall below 10 degrees Celsius. This means the fire alarm system must display a latching supervisory fault to alert the building occupants of dangerously low temperatures in the sprinkler room. In some instances, it has been deemed "acceptable" to protect remote isolation valves (located in an unheated parkade) with heat tracing (as long as a proper controller is employed and is being monitored by the building's fire alarm system). CHECK WITH YOUR LOCAL AHJ! All water supplies used for fire fighting purposes must be protected from freezing. Underground services (when installed in accordance with local Codes and Ordinances) should be able to meet this criteria. Discharging a large quantity of water in temperatures this low may create other hazards you'll have to deal with. Fighting a fire on a "skating rink" may prove to be an interesting challenge, for one. Good question! There are a number of articles to be found on line regarding this subject, most of which deal with avoiding an accidental discharge of water caused by both the higher ambient and the radically fluctuating temperatures encountered in this kind of application. All of them seem to agree that a 135 degree head poses an inherent discharge risk, but not one of the articles I read seems to address what I perceive to be a critical life safety aspect. A dry sauna employs an electrically operated heating element normally secured behind a grill to prevent a patron from accidentally burning themselves. In many instances the grill actually allows you to see the element. Patrons are normally discouraged from placing wet towels or other objects on the grill and are definitely instructed never to throw water into it (in an attempt to produce steam). The typical dry sauna’s heating controller won’t allow the ambient temperature to exceed a certain level and normally operates in a “safe zone” of anywhere from 100 to 120 degrees (Fahrenheit). So what happens when someone throws water into the grill? Well, the heating element is very similar to what you would see on an electric stove top. The operating temperature of some elements could be as high as 600 degrees (Fahrenheit). Hot enough to ignite a paper cup or towel placed on the grill or instantly flash water dropped onto it into super-heated steam. I’m talking steam on the order of 400 degrees Fahrenheit or more! How does one balance the hazards posed by someone misusing the equipment (and possibly injuring themselves) with the operators who wish to minimize the attendant water damage posed by an accidental discharge of the sprinkler head? Employing a 200 degree head would provide such a balance. In the one article I read that actually recommended a rating for the sprinkler head (in this case 286 degrees) I found myself pondering the ramifications (liability wise) for the owner as well as the agency servicing the sprinkler system. The sudden flash of high temperature steam is going to set off higher rated unit regardless, but it will also allow the environment in the sauna to achieve a lethal state before it does. As an owner you would have to ask yourself: Would I prefer to clean up the damage related to a simple water discharge or would I rather run the risk of having a patron injure themselves (or die) and still be faced with cleaning the same amount of water? NOTE: Distance from the element/grill assembly and the sprinkler head should also be part of your considerations. This question has been reworded somewhat from the one entered into Google which was: "what's the fire code to monitor tamper switches grouped together". I hope I've interpreted it correctly. 3.2.4.7(2) reads: "A fire alarm system that includes waterflow-indicating devices shall be designed to notify the fire department in conformance with Sentence (4) when an alarm is initiated." 3.2.4.7(4) reads: "Notification of the fire department, as required by Sentences (1), (2), and (3), shall be provided in conformance with CAN/ULC-S561, "Installation and Services for Fire Signal Receiving Centres and Systems." g) a temperature approaching the freezing point in any dry pipe valve enclosure or water storage container used for firefighting purposes." 3.2.4.9. (3): "Indication of a supervisory signal in accordance with Sentence (2) shall be transmitted to the fire department in conformance with Sentence 3.2.4.7.(4)." Then there's 3.2.5.12 (1) which reads: "If a fire alarm system in a building is required to have an annunciator by Sentence 3.2.4.8. (1), except for hose valves, all valves controlling water supplies in a standpipe system shall be equipped with an electrically supervised switch for transmitting a trouble signal to the annunciator in the event of movement of the valve handle." A specially designed heating element comprised of a coated wire which is wrapped around exposed domestic or WET SPRINKLER SYSTEM piping and is thermostatically controlled to prevent the water in the pipe from freezing. HEAT TRACED piping is usually insulated with glass fibre. In parkades or other exposed locations, tears or other damage to the insulation material (or covering) should be investigated and repaired. Loss of power to the HEAT TRACE CONTROLLER should result in a supervisory trouble signal on the FIRE ALARM SYSTEM and often only requires a RESET of the system once power is restored. The definition above specifically identifies something called a heat trace controller. This device performs a number of tasks. It supervises the special heater wire (used to protect vulnerable sprinkler piping against freezing) for shorts, opens and ground faults (similar to what a fire alarm control does). It also interfaces to a thermocouple which is positioned into the environment that poses the greatest freezing hazard the sprinkler piping will be exposed to. This enables the controller to monitor the ambient temperature and ensure an appropriate response (in this case turning "on" the heating element) is initiated. A failure (or other trouble condition) triggers a relay contact that will initiate a supervisory alert on the fire alarm control or other output type device. The "heat trace controller" is a critical element in maintaining the integrity of the sprinkler system. Some contractors working outside of jurisdictions that have actually mandated the use of these devices (and to save on the trouble and expense of an actual controller) have opted to use "self regulating" heater cable available through most home hardware stores and which normally plugs into an electrical outlet. This has lead to "modifications" where 110VAC relays supervise the power to the cable but nothing else. In order to head off such workarounds Vancouver has adopted a very rigourous set of rules in their Bulletin 2000-016-EL/PL. It serves as one of the finest examples in which two separate disciplines (electrical and plumbing) actually work together to achieve a higher standard. The real answer to this question relies heavily on that term best practice. The fire alarm system should be monitoring a "heat trace controller" which, ideally, provides the means to supervise all the working elements of a sprinkler heat tracing system so as to ensure optimum occupant life safety. Should the low pressure switch on a wet sprinkler system be on the system side (or riser)? Normally speaking a “low pressure switch” isn’t required on a wet sprinkler system. The one exception is where a fire pump is involved. In order to ensure that the fire pump doesn’t cycle needlessly, a small jockey pump is used. It’s designed to maintain a slightly higher pressure on the riser side of the system than the normal inlet (or city pressure). A pressure switch is employed to control the jockey pump. When you turn off the water valve to replace a sprinkler head or to repair a leak on the line, you’re also going to be draining the system serving the specific floor area. The testing drain is usually mounted after the flow switch (for obvious reasons). The switch will respond to any flow of water (from either the testing drain or an activated sprinkler on the zone). In order to keep the fire alarm from registering a “fire” from the sprinkler flow switch, you’re going to have to prevent it from tripping. If the building is equipped with a fire pump, you will also have to disable this at the appropriate time. Caution: There may be an additional flow switch on the main system riser (usually located in the sprinkler room). 1. Go to the main fire alarm panel. If the system indicates that it is being monitored “off site”, then call the number for the monitoring company and tell them that you want to put the system “on test”. They’ll usually ask you for how long. Make sure you explain what it is you’re going to be doing and allow yourself lots of time. NOTE: It’s usually a good idea to have a co-worker standing by the fire alarm panel for steps 4, 5, 8, 9 and 10. Make sure he knows how to silence audible signals and reset the system if an alarm is generated from the zone/area you’re working on (and understands what to do if an alarm comes in from any other zone on the system). 2. Make sure the building management disables any elevator recall functions. If there is an ancillary or auxiliary bypass button available on the fire alarm’s common control, push it. Some fire alarm controls may be equipped with a “silent test” feature or “alarm signal bypass” button. Activating this will ensure that no audible signals will sound accidentally. If you’re unsure about what to do, the building manager is usually the Fire Safety Director and will know the procedures for testing and operating the system. If you’re going to use the silent test feature, a co-worker will have to be positioned at the fire alarm panel for the duration of the time this feature is enabled. 3. Find the discharge tube for the floor you’re draining (in many apartment highrises, the testing drains share a common main drain line that may discharge down in the building’s parkade, outside on the curb, or in the sprinkler room). Make sure it’s not going to spray water on someone’s expensive car or on a pedestrian that happens to be passing by! 4. Turn off the water valve to the affected floor area. Make sure a supervisory signal is received at the fire alarm panel and that your co-worker silences any audible signal. 5. Remove the cover from the alarm flow switch. If a trouble signal annunciates at the fire alarm common control, have your helper silence it. 6. Note the position of the stem in the switch. It’s spring loaded to return to the “normal” or “supervisory” position. Place your finger against the stem so that you’re pushing it in the same direction as the return spring is pulling it. With your finger firmly in place, open the testing drain until you hear water flowing. When the flow of water stops, open the valve all the way. You can release the stem if there’s no more water flowing. 7. Perform the service/repair as required to the sprinkler system. 8. Disable the fire pump (if the building is equipped with one). Have your helper silence any supervisory signals that may be generated at the common control. 9. To refill the system, close the testing drain. Position your finger against the valve stem like you did in step 5. Slowly turn the floor valve until you just start to hear water running. Keep your finger against the stem until the system has been refilled. Continue turning the valve handle until it’s fully “open”. When the flow of water stops, you can release the stem. 10. Put the cover back onto the flow switch. Make sure the “trouble” signal clears on the fire alarm’s common control. 11. Re-enable the fire pump. 12. Have your helper “reset” the fire alarm system. Make sure the sprinkler valve, fire pump supervisory and flow switch troubles are properly cleared. 13. Re-enable the fire alarm signals and any ancillary relay switches you activated. Have the building manager check the panel and re-enable the elevator recall functions. There should be no “trouble” indications on the common control. 14. Call the monitoring station and request they provide you with a list of the signals they received. Make sure to ask if everything has been “restored”. If all restorals have been received and they see a “clear panel”, you may then advise them to put the system back into service. You’re done! Fire alarm devices must be connected through “normally open” type contacts in order to be able to distinguish between a “trouble” condition and an alarm (in the case of a flow switch) or a supervisory condition (in the case of a valve tamper, low air, low temperature, or heat trace failure). Note: Many older type fire alarm panels still in service are unable to detect a “supervisory” fault, so you’ll often find the associated supervisory devices wired through their respective “normally closed” contacts (which results in a restorable type “trouble” indication at the common control). This condition, while acceptable at the time the system was originally installed, does not meet modern-day requirements. Moving a sprinkler valve “off normal” MUST result in a latching supervisory indication on the fire alarm control (and any remote annunciators). Regardless of the type of switch (pressure or vane type), cleaning it is not an option if it has become contaminated by water or corrosion. You must replace the unit. The zone on the fire alarm system to which a standpipe flow switch reports should be programmed to annunciate as a latching supervisory. The reason is that you don’t want a fire alarm transmitted to the fire department if a valve is opened (either by accident or maliciously). Anyone that’s going to be fighting a fire using the building’s standpipe system will have already initiated a fire alarm signal via one of the building’s manual stations (or one of the system’s automatic detectors will have already been activated). What is the type of valve used in a sprinkler system that uses a threaded shaft to indicate the position of the valve? It’s called an OS&Y valve. Here’s a picture of one with a Potter Signal OS&Y supervisory switch installed. A sprinkler head has activated or someone has turned on the alarm “test” valve. The number of sprinkler heads on a riser is determined by a formula that uses the size of pipe, number of branch circuits on the riser, required flow rate, and the type of sprinkler heads that are employed. The answer to this question has nothing to do with the flow switch. This is an indicating device used to initiate an alarm when flow is detected in the system (normally caused by a sprinkler head fusing). In a recent article published to the NFPA Fire Sprinkler Initiative News (we’re posting the video separately below), the simple testing procedures outlined in the accompanying video should be followed to the letter. What the article misses mentioning however, is the required testing of the backflow preventer. Chances are you’ll have two installed. One for the fire sprinkler system and the other for your automatic lawn sprinklers. BOTH need to be tested by qualified personnel and the test report will likely have to be filed with your local jurisdictional authority (Water Board). It’s also a good idea to have the sprinkler system drained so that the system can be charged with fresh water. A COUPLE OF CAUTIONARY NOTES! Many homes have been equipped with sprinklers in the Lower Mainland (British Columbia) for some time now. Vancouver and Richmond have both been very aggressive about having these vital systems mandated. 1. On some of these older systems a separate valve was installed for the home sprinkler system. Make sure this is ON! 2. The flow switch depicted in the video is also likely present and interconnected to your home’s smoke alarms. It is extremely important to ensure that you confirm the operating voltage of the interconnection before you replace smoke alarms that may be older than ten years. Many older models switched 120VAC directly through the interconnect wire (it’s ORANGE if 120VAC, YELLOW or RED if 9VDC. If you don’t install a compatible low voltage module with the new smoke alarms, you could very well impose 120VAC onto an interconnection circuit that’s only supposed to operate on 9VDC. This is extremely hazardous, will damage your new smoke alarms and may may actually cause a fire! "Waterflow devices incorporating an adjustable time delay shall be set with a sufficient delay not exceeding 90 s to reduce the possibility of a false indication (e.g. caused by water hammer)." The single letter "s" refers to "seconds". 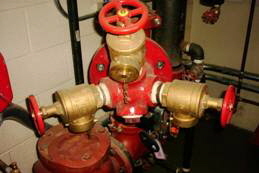 Many modern high rise buildings employ fire pumps to augment normal municipal water pressures so that the sprinkler system is able to provide the rated design flow at each sprinkler head. Most modern codes dictate that two conditions regarding the status of the fire pump be monitored by the fire alarm system. They are "trouble" and "activation" (or "run"). The first condition should monitor several aspects: "Overspeed", "power failure" (or bypass/off) amongst them. The second is pretty well self-explanatory. Most "trouble" conditions on a fire alarm system "clear" when the device (or circuit) is restored to normal. When it comes to a fire pump or generator trouble however, this , as well as "activation" (or "run") should be monitored by a latching supervisory circuit as it prompts the user to physically attend the mechanical room to ensure an all clear condition exists (that there isn't an excessive amount of water pooling under or near the pump for instance) and that all the attendant valves and fixtures are in a "normal" condition. More details can be found in a related question HERE. A fire pump controller provides the means to actuate, test, and service this vital component of a sprinkler system - most usually located in high-rise apartment, large warehouses, and office buildings. Controllers feature a set of indicator lamps that tell you the status of the fire pump (it's usually mounted in the same room as the pump but in some instances the sprinkler room is too small or there's a risk of flooding which means you'll have to find it). There's a "power on" lamp, a "fire pump running" lamp, and additional "trouble" indicators depending on what the manufacturer may decide to include. There are two types of fire pumps: engine driven and electric. Both technologies controllers employs a sensing line. A sudden drop in pressure in the line (caused by the actuation of a sprinkler head) will trigger a switch in the controller which will turn on the fire pump. The pressure in the sensing line is maintained at a higher level than the normal static water pressure in the system by a "jockey pump" (which employs it's own separate controller). This prevents the inadvertent actuation of the fire pump if there's a drop or a spike in the supply pressure. There are normally two supervised outputs on a fire pump controller. One is activated when the pump is "running", and the other if there is "trouble" condition. There may also be a third output called "phase reversal" (but typically on older controllers, this is routed through the common "trouble" output). All should be monitored by separate latching supervisory circuits on the fire alarm control panel. The real answer to this question relies heavily on that phrase best practice. The fire alarm system should be monitoring a heat trace controller which, ideally, provides the means to supervise all the working elements of a sprinkler heat tracing system so as to ensure optimum occupant life safety. Most definitely NOT. You are not permitted to run wire along a sprinkler pipe unless it’s associated with heat tracing or fire alarm interconnections (valves, flow & pressure switches). Wrapping ANYTHING around a sprinkler head is a major NO-NO! This depends on the largess of the individual that found the deficiencies. If the sprinkler system is RED TAGGED, this means that a copy of the report should have been filed with the fire department. I emphasize “should”. If the servicing agency (or the technician doing the testing) is giving you some time to initiate correction of the problem, then your question sort of answers itself. Once the fire department finds out, however, you may find yourself facing a twenty-four hour notice (or a fire watch) until the problem is corrected. Worse, if the fire department were to discover the RED TAG on a routine building inspection, the technician who put it there could be in serious trouble if he didn’t follow through on the proper procedure. A classic example of a botched RED TAG procedure is featured HERE. We review RED TAGGING HERE. There are two tests and one inspection required on a backflow preventer serving fire protection system piping. The forward flow test and the performance test are required annually. The internal inspection is required every five (5) years. NOTE: There is an exception to performing the forward flow test for those systems that employ fire pumps. We’ve never had an internal inspection on our backflow preventer and our building is seven years old. Do we need to have it inspected? We would suggest you check with your local Jurisdictional Authority (the Fire Department). While they may not have had the opportunity to develop a policy with respect to older backflow preventers (or ones that have been in service for more than five years), we would recommend the safer approach and have your unit internally inspected. Make sure you employ a licensed plumber for this service, and that you provide them with the unit’s make and model number so they can source suitable replacement parts to bring with them. How many spare sprinkler heads are there required to be on a given site and where are they supposed to be located? NFPA 25 (2008) is referenced by Canada’s National Fire Code 2010 edition. Section 5.4.1 is entitled “Sprinklers” and deals with replacement sprinklers. Ideally you should find the spares cabinet in the mechanical or sprinkler valve room. NFPA 25 requires fire pumps to be run on a weekly basis for a recommended period of thirty (30) minutes. You will require training on the proper procedure to follow (which may include resetting any supervisory conditions at the fire alarm control panel). Please contact your fire equipment service provider. NOTE: "Any" is a word that could suggest a "trainee" technician and for the purpose of providing a suitable response, I'm going to assume that the fire alarm technician that will perform the testing is familiar with (and has some training on) the operation of the specific fire pump controller that will be the subject of the test. A fire alarm technician's "testing" of a fire pump is usually limited to simulating a failure of the primary controller and initiating a "run" cycle to ensure the appropriate supervisory signals are received by the fire alarm control and any connected remote annunciator(s). The failure simulation is usually accomplished by using the circuit disconnect means on the controller. It's been my experience that the testing of the fire pump is usually coordinated with the testing of the building's sprinkler systems. Fire pump testing involves performing flow and pressure tests which entails the use of specialized equipment and training which isn't something most fire alarm technicians are capable of doing. Normally, it's the building owner's responsibility to "run" the fire pump on a monthly basis to prevent damage to the impeller and related equipment from corrosion. If it's impractical to perform both annual tests (fire alarm and sprinkler) concurrently, the monthly "run" test is a good option that will actually confirm correct indication is received at the building's common control and annunciator(s). No, actually, the National FIRE Code does, however. Fire pumps (and sprinkler systems) have to be tested in accordance with NFPA 25(2008). NFPA 25 requires you to RUN your fire pump on a weekly basis, and perform other periodic tests (monthly, quarterly, semi-annually, and annually) in addition to a DAILY inspection. You can download our Building Annual Test Report and turn to the sprinkler section which details the referenced testing and inspection requirements.